I just heard today from the distributors in Dublin that I was the top-selling UK Tupperware consultant for the second quarter of 2011. Given that six months ago I had quit selling Tupperware after the UK distributor went out of business, I am very pleased with myself for doing so well. Thanks very much indeed to customers past, present and future, for your orders and your enthusiasm. And it's full steam ahead for what is my most exciting Tupperware adventure yet -- my 3-day 1960 Tupperware party at the Vintage at Southbank festival next week. I was frankly daunted to be shown a 4 metre square blank space in the Royal Festival Hall last month, in which I have to create a kitchen set from scratch. I work alone, and I have pretty much zero budget, but I decided to face the challenge. 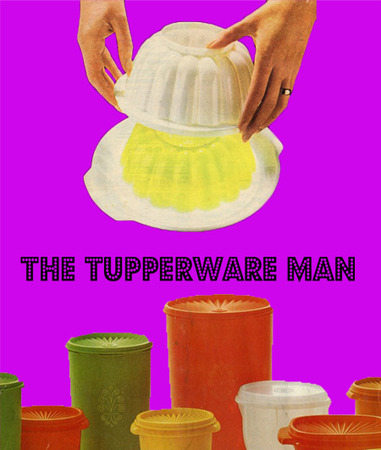 The basic premise is that I am re-staging the first UK Tupperware party, which was in Weybridge in 1960, but I reckon I will be taking a lot of liberties with the period detail. But not only does my set need to showcase the Tupperware, and look more or less authentically 1960, but it needs to hold its own next to the professionally-designed and dressed living room set right next to me, hosted by Foyles bookshop. Sorry, I think I just threw up in my mouth a little bit out of sheer terror. The festival organisers have trusted me to do a good job of it, despite my limited experience and resources, and I am determined to pull it off. 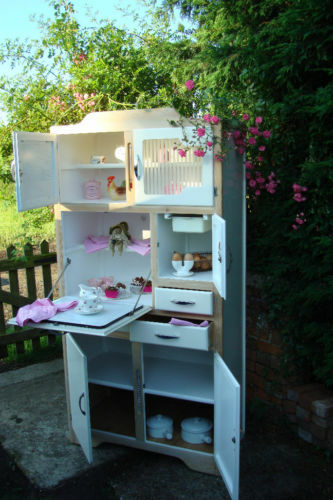 I have sourced some great period kitchen furniture from eBay -- although some of it will be going straight back onto eBay the day after the festival! I bought this lovely 1959 kitchen dresser, restored to its original glory, and I think I will be keeping it. I have ordered a roll of checkerboard lino for an authentic vintage kitchen feel, and I am trying to work out how to lay it without ruining the Festival Hall's wooden floor. Afterwards, I may well lay it in my own bathroom and kitchen. As well as all the Tupperware to dress the set and demonstrate for the punters, riffing on the classics I have been blogging here the last month or so, the lovely people at my local vintage shop, Radio Days in Waterloo, have been kind enough to lend me some original 1950s and 1960s items. These include a fantastic baby blue rotary telephone, a politically incorrect minstrel tea-cosy, some late 50s/early 60s magazines, and other gems. My sister Lois will be the party hostess, and she has bought a perfect 1950s frock for the occasion. The official Vintage Festival blog had a piece about me. Okay, I pretty much wrote it for them, but they published it with some brilliant retro graphics. Time Out London's preview of the festival mentions my party as a highlight. Thanks! The charming Kiera Buckley-Jones of BBC Homes and Antiques magazine is dressing the Foyles living room set next to mine, and is looking forward to us being neighbours. I will be in the ticketed performance area inside the Royal Festival Hall, not in the public market area outside, but I do hope to have a chance to work the crowds outside in the market too, and hand out a few catalogues. I am nervous, but definitely excited.